Wiener Schnitzel or alternatively, Vienna Schnitzel (Schnitzel in German means a cutlet without bones), is a traditional Austrian dish and is a popular part of Viennese and Austrian cuisine, consisting of a thin slice of veal coated in breadcrumbs and fried. In Austria the dish is traditionally served with a lemon slice, lingonberry jam and either potato salad or potatoes with parsley and butter. While the traditional Wiener Schnitzel is made of veal, it is now sometimes made of pork, though in that case it is often called Schnitzel Wiener Art (Germany) or Wiener Schnitzel vom Schwein (Austria) to differentiate it from the original. In Austria, the term Wiener Schnitzel is protected by law, and any schnitzel called by that name has to be made from veal. 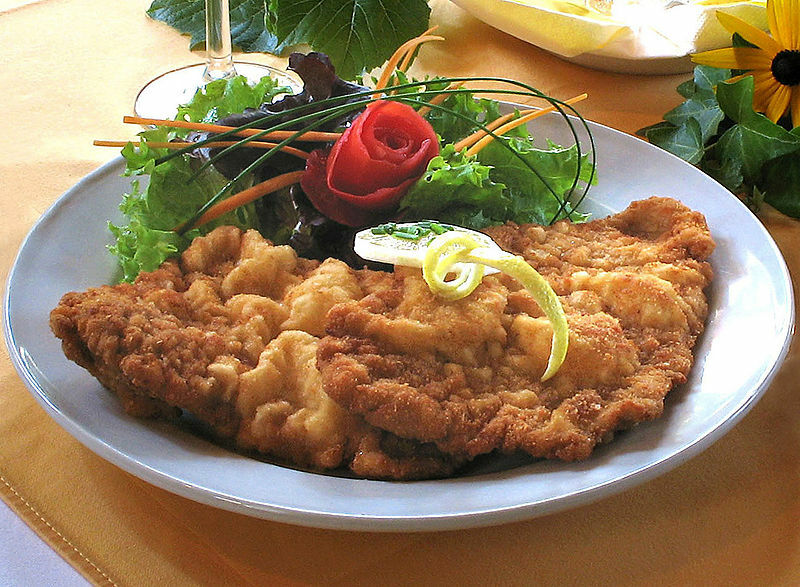 The dish may have originated in Milan, northern Italy, as cotoletta alla milanese, and may have appeared in Vienna during the 15th or 16th century. In Argentina, the schnitzel is one of the most popular meals, called milanesa. It is just one of the many influences of Italian immigration to the country since the end of the 19th century. In Russia the dish is called "отбивная" (which literally means "a piece of meat which has been beaten"). Russian cuisine includes recipes of schnitzel prepared of pork as well as beef/veal or even chicken meat.